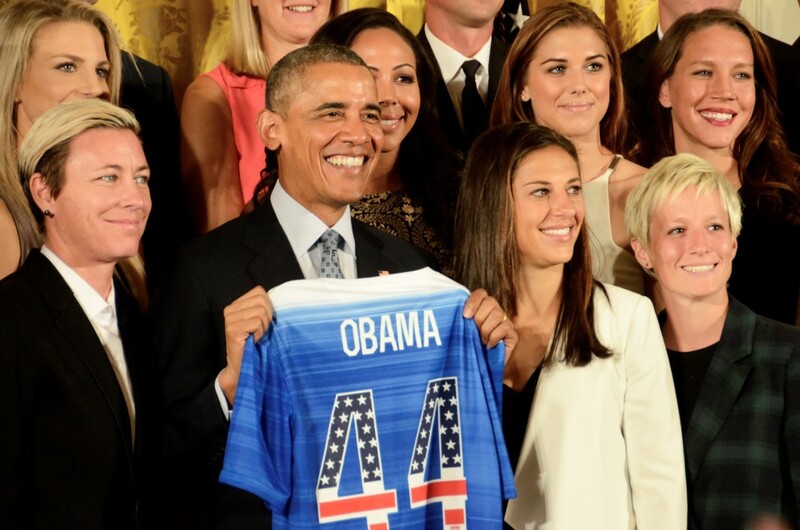 President Barack Obama poses with members of the U.S. Women’s National Soccer Team and the jersey they gave him at a ceremony at the White House Tuesday to honor the team’s FIFA World Cup victory in July. SHFWire photo by Rebecca Anzel. WASHINGTON – Ayla Ludlow, 13, was not on the field when the U.S. Women’s National Soccer Team won the FIFA World Cup, but she was invited to the White House on Tuesday to help President Barack Obama honor the team’s victory. In June, she wrote a letter to Obama expressing her love of the World Cup tournament and her displeasure that women are not treated equally in sports. 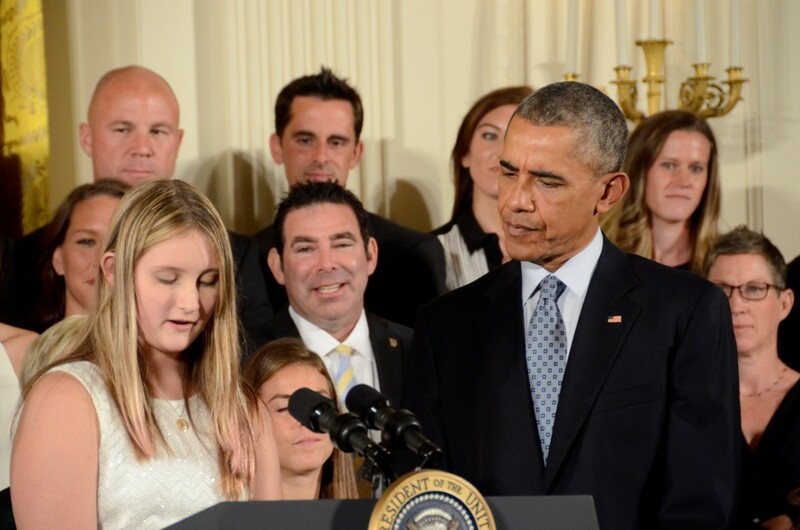 Ayla, of Pembroke, Mass., told the president that as she watched the tournament, her brother said men are better soccer players. She asked for the president’s help. “A lot of people agree with you, and nothing gives me more hope than knowing that we’ve got a whole generation of young women like Ayla ready to take the world by storm,” Obama said. With the team’s 5-2 win over Japan in the World Cup final on July 5, the women’s team won FIFA’s highest accolade for the first time in 16 years and attracted the largest television audience for a soccer game in the U.S.
“This team taught all America’s children that ‘playing like a girl’ means you’re a badass,” Obama said. “Perhaps I shouldn’t have used that phrase,” he added as the crowd in the East Room laughed. He recognized many of the players by name for their part in the victory, including forward Abby Wambach and her “not-so-quiet dominance.” Wambach, 35, announced her retirement Tuesday. Ayla Ludlow, 13, reads a letter she sent to President Barack Obama about her displeasure that women are not treated equally in sports. She was at the White House ceremony Tuesday to honor the U.S. Women’s National Soccer Team. SHFWire photo by Rebecca Anzel. The Women’s National Team launched its #SheBelieves campaign about a month before winning the World Cup as “a message to young girls that they can accomplish all their goals and dreams,” according to its website.